Jeremy lives in London, UK, and after dozens of trips to Belgium over the past 9 years, this was his first beer trip to Germany. He has previously written many articles about his beer travels for the Burgundian Babble Belt, and is a frequent contributor to that board and has also contributed to the Tim Webb's Good Beer Guide to Belgium." ‘Go to Bamberg, you’ll love it’, they said. In fact they’ve been saying it for years. Finally I gave in, and despite never having been blown away by German beers, I decided to book a trip to see what all the fuss was about. Would they be right, what would I find, would I like Bamberg, and most importantly, would I find any decent beer? Surely all those people couldn’t be wrong, could they? Our trip started with a late Friday night flight from Stansted to Nuremberg. I refuse to call Stansted ‘London Stansted’ because anyone who has travelled out there from the centre of town will soon realise its nowhere near London. Anyway, we made it painlessly enough, and after a short delay we were on our Air Berlin flight for the short hop to Nuremberg. We touched down at 11.05pm local time, were checking into our hotel at 11.45pm, and were in our first pub at 5 minutes to midnight! Only problem was that it was clear that they were closing up in the Kloster Andechs/Das Wirthaus bar beneath our hotel, the overpriced Hotel Deutscher Kaiser, so we crossed the road to Barfüsser, a brew pub which thankfully stayed open till 1am. Mind you, service varied between non existent and very slow, but we persevered and got the holiday off to a good start with a couple of very tasty Barfüsser Blondes (beer not women J !). A great subterranean barn of a place, this was a great tavern for our first beer of the trip. Next morning it was freezing, damp and miserable, so where better to spend the morning than the Documentazion Centrum, the huge, amazing museum which tells you everything you ever wanted to know about the Nazis, the Nuremberg Rallies, Hitler and the Third Reich. At the end, you come out into the middle of the gigantic, unfinished stadium which still stands and which is absolutely monstrous, especially when you realise they intended to make it about twice the size once completed. Incidentally, the stadium where England plays next month in the World Cup is in the same area that the Nuremberg rallies took place….. Anyway, I was delighted to discover that Landbierparadies just happened to be a short walk away, so about 10 minutes later we were walking into the pub. This was the first great pub of many that we’d find thanks to John White during the week. A great place featuring a wide ranging list of Franconian beers, one of which is served from the wood each day. 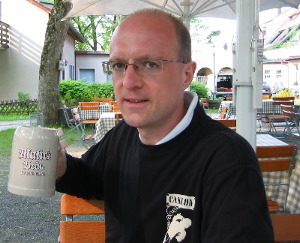 I had a Brauerei Krug Lagerbier and a Brauerei Sauer Schulkla Rauchbier. Both were superb. Theresa had the Neder Schwarze Anna, which also went down well. Excellent pub, friendly staff, and a fab selection of beers. We weren’t so fussed on the food, the goulash soup being excellent, the pork thing and those bloody awful dumplings called ‘Kloss’ were, well, bloody awful. Sponge balls which you could play tennis with, those things were NOT edible! Anyway, moving on, we wandered back to the centre of town and arrived in an Irish pub just in time to see Wayne Rooney bust his foot and United get stuffed, so we didn’t need to loiter long before a quick hotel stop. Visited a couple of churches in the centre, then trekked up to the wonderful castle, which has superb views of the city. Then the rain returned but conveniently we were almost next to Hutt’n, superb bar number 2. Done up something like a Swiss cabin – believe me, it works – this is another wonderful cosy bar with an excellent beer list. I had an Ammerndorfer dunkles landbier and a Brauerei Fischer Rauchbier. It was only a quick stagger from here to the Hausbrauerei Altstadthof Nuremberg, which we really enjoyed. A more modern brewpub, we enjoyed the beers, especially their Schwarzbier, and the tasty Wiener Schnitzel and frites, the first of many for the week. Next stop was the Schlenkerla Tavern. Great bar number 3, what a superb place, full of beams, old wood, great character and of course great beer, I just had to have my first Schlenkerla Rauchbier of the week here, again the first of many. On entering, the owner saw me with the John White downloadable guide to Bamberg, which also features Nuremberg. He asked me what it was, I showed him, and he was fascinated. He took it away, copied the pages on his pub, and was all smiles. He gave the copy to some locals, who read it and expressed approval. The owner then came over and offered me some of the Schlenkerla schnapps, we had a hearty toast and each downed a shot with aplomb! On departing, Theresa was then presented with a small Schlenkerla glass: all for appearing with a John White downloadable guide! After all this excitement, we headed back to the hotel in time for last orders at the Kloster Andechs pub, where I had the dunkel and the doppelbock, which, after all that beer, was not really what I needed, but it was a great way to end a superb day in Nuremberg, which as you can see, has plenty of excellent beer destinations alongside some fascinating historical sights. Feeling rough – I blame the schnapps – or was it a dirty glass? – we got a train just before midday and made quick work of the 40 minute train journey to Bamberg. After a cab to the hotel, we were just in time for a late lunch then a look round town before meeting Fred W at Stilbruch at 5pm. This is a regular haunt of Fred’s on a Sunday, for the Brauerei Hubner landbier, which is indeed very tasty. Just the one beer here before heading on a small crawl with Fred, firstly for our first visit to the Schlenkerla Tavern – an unbelievable place; then Spezial, another unbelievable old tavern with immense atmosphere, and pretty good deer goulash to go with the superb Lagerbier and marzen, and finally Klosterbräu, which was right next to our excellent hotel in the river, the Hotel Sankt Nepomuk. At Klosterbräu we were able to sample the gorgeous maibock, along with the braunbier and the also excellent schwarzla. All sampling of course done in the superb surroundings of this wonderful old brewery tavern. Our initial impression of Bamberg? Wow! After a cold and wet weekend, on Monday it finally started to warm up. After a walk up to the extremely impressive Cathedral, we checked out the Neue Residence, one of the many superb old palaces we found during the week. Once done with the tourist stuff, it was time for a beer, so on the way down the hill we decided to have lunch at Ambräusianum. Rather oddly, as it was only half full, we were told that there would be a wait of up to an hour for lunch, so we were advised not to eat here. Not sure what the problem was, but I appreciated their honesty, and so instead I had the sampler of three of the brewery’s beers – all of which I found to be pretty good. Not world beaters, but tasty and enjoyable, especially the helles and the wiezen. After lunch at an Italian place it was back to the tourist trail, checking out ‘Little Venice’ – which had more of the little and less of the Venice than I expected. A quick pit stop at the Schlenkerla was followed by a visit to St Stephan’s Church, before we set off on the 15 or 20 minute walk across town to Brauerei Keesmann and Mahrs. At Keesman we sat outside in the very pleasant courtyard out the back, and I sampled the fabulous Herren pils, which was by some distance the best pils of the week. At Mahrs, we had timed our visit for the daily cask of U. I found this good, but not quite as amazing as I had expected. The place itself, though, is a world beater of quite magnificent proportions: wood panelling, a fantastic old green tiled fire, beams and oozing great atmosphere. From here we walked round the back of the station to Café Abseits, where we once again met up with Fred. We all really liked this place, quite the antidote to all the old taverns, with its more modern feel and a great beer list. We shared Mönchsambacher lager and maibock, Huppendorder Zwickel from Brauerei Grasser, and Hartmann Erbschank 1550 Schwarzbier, and I was well fed with another weiner schnitzel. Once again we were amazed at how cheap everything was: the three of us ate very well, and had a load of beers for less than 25 euros. Bamberg is not a place that stretches your budget…..
Schlenkerla was calling out for another visit when we got back to the centre of town, and it would have been rude not to oblige. My birthday. Waking up to warm sunshine, coming out of our hotel block (we were staying in the peaceful annexe – the Molitorhaus) round to the main hotel for breakfast, we passed an incredibly beautiful view up the river each morning. Today it was perfect. After coffee by the wonderful Altes Rathaus, it was up to the Dom for a poke around the Alte Hofhaltung, then a walk up to Kloster St Michael, on Michaelsberg, another one of the hills which has yet more magnificent views over this great mediaeval city. Very reminiscent of Prague and the climb up to, and the view from, the Strahov Monastery. The views of Bamberg from the front of the old church were stunning. Late morning and it was time for a birthday lunch, and as it was my shout, we headed across town to Brauerei Spezial. On the way, we saw Fred as he emerged from his morning’s German class. Fred being a sensible chap, he didn’t need too much arm twisting to join us for lunch at one of his favourite breweries. So, a few minutes later and we were celebrating with Spezial rauchbiers, and I had another excellent goulash, this time with pork. Sitting in the warm sun in the little courtyard out the back, we once again really enjoyed Spezial. Fred had some work to do, so he left us as we crossed the road for our first visit to Fässla. I had heard it was a smoky old place, so was pleased to see that it also had an outside area, where needless to say, we sat while sampling my first Fässla beers. The Lagerbier and the Zwergla were both very good. Later we had our first Bamberg keller experience, when we made it up the hill to Wilde Rose Keller. A huge, leafy garden with literally hundreds of seats, the Maisel brewed maibock went down a treat in the afternoon heat. As it was a workday early in the week, it was suitably quiet and very laid back in this lovely leafy haven. Carefully navigating some very expensive looking backstreets, about 15 minutes later we were at Brauerei Greifenklau. As it was now officially summer, the only part of the complex that was open was its garden, which suited us fine, especially as we got the prime table right by the fence, which gave superlative views over to Altenburg castle, on another of Bamberg’s hills. It was now HOT as well as sunny, and it was proving to be a great way to spend a birthday. From here we headed downhill and soon arrived at the famous Tapas Bar. Once again we sat outside overlooking another jaw dropping view – Bamberg is seemingly full of such great vistas. This view was over to the back of the Dom. Though it has a good range of beers, this is not the best tapas bar we’ve ever been in, and though the food was passable, and very, very cheap, I wouldn’t rush to eat here again. The beer I chose here was another Mönchsambacher lager, which pleased once again. After dinner, we met up again with Fred for another pub crawl, this time starting at Torschuster, which is one of Bamberg’s best pubs, small but with creeping breweriana, and a good selection from 7 of the town’s breweries. I had another Keesman pils and another Fässla Zwergla here, before we headed for our first experience of Pizzini. Wow, what an absolute gem. Anyone who appreciates old brown cafes would love Pizzini: it’s an old brown café par excellence! Wood panelling all round, great old photos, cosy nooks, and live music in the form of locals playing the piano, plus tonight one of them on the trumpet, this place is run by an unsung hero of the beer world, an old woman with the great name of Wally Muck, whose passion this place obviously is. A great, great, bar with an ambience to die for, under no circumstances should any visitor to Bamberg miss this bar. Fred left us after a couple of Spezial rauchbiers, as he had his German class the next morning, but we felt like a nightcap, so I dragged Theresa up the hill to the amazing Stöhrenkeller, another superb little bar, more modern but with the obligatory scrubbed tables, and another small but perfectly formed beer list. A gorgeous laid back pub with a Schlenkerla Rauchbier was the perfect way to round off a very memorable Bamberg birthday. Somewhat knackered after a heavy day, what better activity than a trip out of town to some local breweries. Using Fred’s advice, we took the number 7 bus to Memmelsdorf at 11.25am, stopping off one stop before reaching our destination to check out the Schloss Seehof, which has a bus stop of that name. This is a remarkable castle in a lovely park, just on the outskirts of town. If you show up just before midday you also get a free fountain display when they turn on all the water jets around their elaborate fountains, which is quite spectacular. Back on the bus its only a few minutes to Memmelsdorf, and it was now time for lunch, which we had at Brauerei Drie Kronen. This was one of the best meals of the trip, we both had excellent schnitzels in a superb beery gravy sauce with mushrooms. The beers are available in sampler portions: the Stöffla smoke beer was interesting without being exceptional. Back across the road to the bus stop after lunch we were sitting waiting for the number 17 to Merkendorf when two cyclists pulled over calling my name. It was one of those slightly surreal moments, when you are in the middle of nowhere, and someone who you’ve never met before finds you and stops to say hello. It was Nick B and his wife Becky, who we knew may also be heading for Merkendorf that afternoon. Anyway, they went on ahead on their bikes and we soon caught up with them at the brewery. Brauerei Hummel in Merkendorf was a highlight of the trip. First off it’s a great place, with a large outdoor seating area at the back of the brewery, and some cosy rooms inside. However, as it was baking hot it was outside for us all. Unusually for these parts, they serve a range of different sizes of beer, making it possible to sample more beers, so I tasted the Kellerbier, the Marzen, the Räucherla, the Heller Maibock and finally another Kellerbier. All were superb, with the Kellerbier being one of the beers of the trip. After an hour and a half chatting with Nick and Becky – who moved to Franconia from the US 18 months ago - and tasting the beers, it was time to get the bus back to Bamberg: it was probably just as well given that I could easily have spent the rest of the week at Hummel – what a wonderful place. I will definitely be back…. After a quick hotel pit stop it was time to check out the Spezial Keller up the Stephansberg hill. We had been told that the view was pretty ‘spezial’, and once again they were right – the view is amazing, surely one of the best in town. 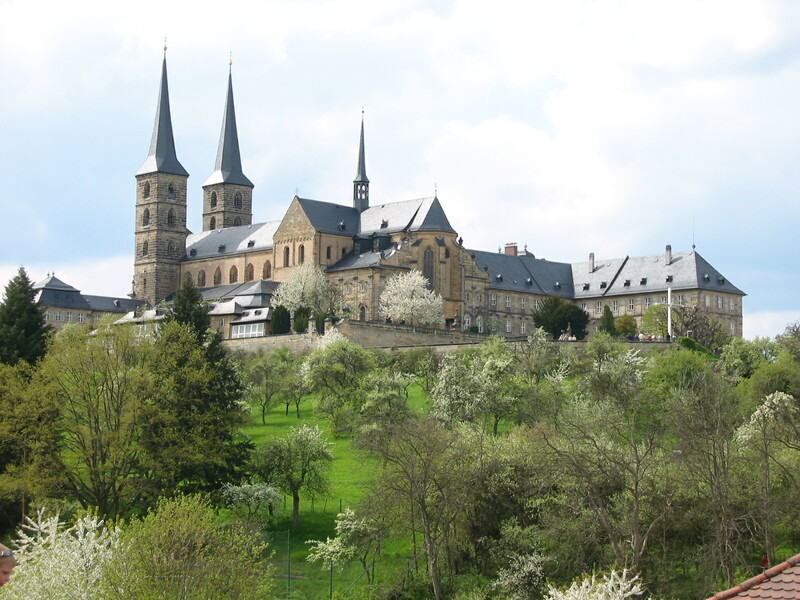 The huge beer garden overlooks three of Bamberg’s great churches, including the Cathedral and Kloster St Michael. And of course the beer is extremely acceptable too. Dinner was some of the ‘thai influenced’ fare at Der Pelikan, which was ok but with way too much coconut milk, too many odd vegetables that don’t belong there, and not enough spice. Apart from that it was perfect, and the Pelikan is notable for one of the beers of the week, the Huppendorfer Vollbier, which was really superb. Time for our day trip to Würzburg, a larger city than Bamberg which is about an hour west on the train. We had heard it was a bit special with notable architecture, great wine and a scenic river running through the city centre. It had all that and more – what a great city Würzburg is. First stop was the home of the Prince bishops, the almighty Residenz, one of the most amazing old palaces I have ever seen. The Spiegel Kabinett is the highlight, a sumptuous mirror and gold clad room, the restoration of which was only completed in 1987 after wartime bombing. You really have to see it to believe the intricacy of the work. Next door is the Hofkircke and the Hofgarten, a church and the gardens which complete the estate: again, both are stunning. After spending the morning at the Residenz, it was time for lunch. Again this was to prove a highlight of the trip, as we dined at one of the top wine places in this famous centre of German wine, the Weinstuben Juliusspital. By some distance the best meal we had all week, we both had the pork medallions in a rich gravy with mushrooms and perfectly fried potatoes. We also demolished a couple of samples of various of their wines, plus a bottle of one of their finest reislings, which helped our enjoyment considerably. The setting was also wonderful, as we sat in the intense heat in the lovely courtyard out the back. The interior of the place was also superb, with several rooms with beams, pictures, tiled floor and wood panelled walls. We will go out of our way to return to this fantastic restaurant. We managed to drag ourselves away to see more of the city, and after three extremely impressive churches, including the Dom, we hit the Alte Mainbrucke, the old bridge over the river which is slightly reminiscent of Charles Bridge in Prague. As soon as you turn the corner onto the bridge, you see the gargantuan Festung Marienburg – the old castle complex – hulking dominantly above the town. A stiff climb of about 20 minutes – hard work on a hot sunny day – took us to the top for yet more wonderful views of the city. Würzburg was a stunning success, but it was soon time to return to Bamberg. Reaching town in time for a drink before dinner, we had a quick one at the Maisel outlet, the Bamberger Weissbierhaus, which was ok but not on the same high level as many of the other taverns, then another quick one at another Maisel pub, Zum Sternla – the oldest pub in Bamberg, apparently - followed by dinner at another wine place for Theresa, the Würzburger Weinstube, which was above average price for Bamberg, though sadly not above average quality…. Way above average quality was the Schlenkerla tavern, where we diverted for a smoky night cap as an antidote to all that wine, followed by our return visit to the Klosterbräu for another night cap, where we closed the bar at the very late hour of just 10 minutes to 11pm! With the wonderful weather still very much with us, we decided that it would be a good day to wander down the Regnitz river south east to the small suburb of Bug. Here we would have lunch at the splendidly named ‘Buger Hof’, which as well as having a name amusing to Brits, also serves some fine grub. Another weiner schnitzel was the order of the day for me, washed down with a reasonable but rather ordinary Reckendorfer Vollbier. With plenty of time on our hands, we decided to walk back to Bamberg instead of taking the bus, and 45 minutes later we were back in town. This is a lovely walk down the river which is highly recommended. Next on the busy schedule was my brewery tour at Brauerei Schlenkerla. I met Matthias the brewer at 3pm as arranged, and we were soon heading round the great old brewery, which reminded me in parts of both St Bernardus and Orval. The one thing that neither of those breweries has, of course, is caves, and as well as the on site maltings, that was the part of the tour that was of most interest. Once in the caves, I was treated to samples of both the Lagerbier and the amazing Urbock, straight from the tanks. Both were sublime. We didn’t loiter long in the caves, though, as it was only 4 degrees Celsius down there, quite a drop from the mid 20s temperature outside! Anyway, it’s a fascinating brewery, Matthias is a generous and convivial host, and I really appreciated his taking the time to show me around at the end of another busy week for him. Theresa didn’t want to see yet another brewery – even a special one – so I had left her in the Spezi keller up the road, so on collecting her I felt that I really should have a beer, which was a good opportunity to compare one of Bamberg’s smoke beers with another. I have to say that much as I love the Schlenkerla beers, the Spezial rauchbier is really wonderful too. From here we went to the third of the three kellers on the Stephansberg, the Mahrs Keller, which turned out to be my favourite (though I loved them all). The main reason I loved it was due to the fantastic ‘Gig’ beer that they had on tap there, which wasn’t available at the brewery tap. This dark beer was easily in my top five beers of the week, full flavoured and very more-ish. So, we had some more… Tearing ourselves away from here was hard, but we eventually headed back into town for dinner at the Bolero, a much more authentic tapas bar on the site of the old Polar Bear brewery. This was a very good meal, much better than our previous tapas experience. However, beers here are ordinary and I passed. It was then time for our final visit of the week to Schlenkerla tavern, where we once again met up with Fred, and this time also Lorenzo, who had arrived in town that afternoon with a group of Italian beer nuts. Given that I’ve drunk beer with Fred and Lorenzo in London and Belgium on many previous occasions, it was good to add Germany to the list! Lorenzo headed back to the hotel as he was tired out after a long day, so Fred, Theresa and I finished our drinks and headed for a return visit to the wondrous Pizzini. Walking in we were only slightly surprised to see Lorenzo had actually meant ‘Pizzini’ when he said ‘bed’! Anyway, Pizzini was superb once more, and I really enjoyed my final two beers of the week in Bamberg, Fässla pils and Andescher Dunkel. The piano was being played, the ambience was superb, and it was a fitting end to a fine week. We said our goodbyes to Fred, who had been great company all week, and looked forward both to our return to Bamberg and our next beers with Fred. Flight times back to London from Nuremberg weren’t too convenient, so we had arranged to fly home from Munich, which gave us a handy excuse for a flying visit. Arriving just in time for a late lunch, we soon headed out to explore the old town centre on a walking tour we got from our book. The tour took us past a whole host of superb sights, including many great churches, monuments, and, surprisingly, several good pubs and beer halls. The first of these was Nürnberger Bratwurst Glockl am Dom, which served up the most amazing Nürnberg sausages with tasty fried potatoes, to go with the Augustiner beers, the helles being served from the wood. We really loved the Augustiner Grosgastätten bierhall, and were lucky to find the maibock on draught here, as well as the Edelstoff. After a return visit for more sausages at the Nürnberger place, our final beery stop was the Ayingers Speis & Trank, a very smart, laid back and normal place opposite the Hofbrauhaus zoo. Here we had one of the beers of the week, the Ayingers Kellerbier, which went down a treat and rounded off an excellent half day in Munich. Off to the airport for the easyjet flight back to sunny Stansted, and we were home in a jiffy. So, were they right? You bet: Bamberg is superb, both in terms of being a great city with great sights, and of course in terms of its beery pedigree. It has some of the best taverns in the world, serving some of the world’s great beer. I had been slightly concerned that I may not like the beer so much, but I really enjoyed a different beer experience after all those trips to Belgium. Schlenkerla: one of the finest taverns in the world; totally wonderful place, when in town, try to get here every day as it’s a work of unparalleled genius. Spezial: another amazing old tavern, again its an absolutely don’t miss. Mahrs: another in a very similar mould, another world beater. Klosterbräu: right by our hotel so it was easy to visit a couple of times, we loved it and would recommend not missing this one. Greifenklau: well worth the trek up to this one; very good view from their beer garden so go in the day time on a hot sunny day. Keesmann: slightly more modern and again with good outdoor seating area out the back. Fantastic pils which is unmissable, but you can find it elsewhere in town too. However, I would also advise not missing this one, especially as its so close to Mahrs. Ambräusianum: went once, very modern in comparison with the older taverns above. I thought the beers were pretty good, but there was too much else to do to prioritise a return visit. If you have to miss one or more of the breweries, this is one that you can afford to miss, but as its right by Schlenkerla, you may as well pop in at some stage. They also do samplers of the beers, which is convenient. Bamberger Weissbierhaus: we went here for our Maisel fix rather than the actual brewery tap. It's ok but missable if you are pushed for time. Its worth saying that while I’ve ranked the above from 1 – 9, all of numbers 1 – 7 are very highly recommended and I will definitely go back to them all. Coming in 7th on the above list does not in any way infer that the place is not good – its just that there is extremely tough competition – you should definitely aim to get to all of those 7. I didn’t bother with Maisel brewery tap as it wasn’t convenient, and I wasn’t interested in going to Kaiserdom. Mahrs: as above, we had a stand out beer here, the wonderful ‘Gig’. Spezial: absolutely stunning view, don’t miss it. Beer is pretty tasty too! Wilde Rose: loved this one, its very leafy, huge, with some good Maisel brewed beers. Pizzini: quite simply one of the best bars I have ever been to. Definitely under no circumstances miss this one – it’s a brown café par excellence, with understated sophistication, great beer, and an ambience to die for. The woman in charge is an unsung hero of the cafe scene, IMO. Café Abseits: entirely different from Pizzini and the brewery taverns, but a very good café, much more modern, with a good selection of beers. We only got there once as it’s a bit of a hike, but definitely visit. Stöhrenkeller: another don’t miss, an absolute beauty that you can do on the way down the hill from the kellers. Great late night place with interesting selection of beers. Torschuster: small but well worth a visit, as it’s a lovely little pub and they serve beers from 7 Bamberg breweries. Tapas Bar: another stunning view from the terrace. Some fine beers here too – would recommend going for the beer but not the tapas, which was not great. Stilbruch: only went the once, to have the Otto Hubner bier on the Sunday with Fred. Good bar but if pushed for time I wouldn’t prioritise it above numbers 1 – 5 above. Pelikan: this one should probably be higher on the list in terms of beer selection, but we were put off by the odd Thai food and the fact that we sat in the garden which was busy and I wasn’t comfortable there, so we should have moved inside – which is lovely - but we didn’t. So our visit here wasn’t the best but I will return – for beer only – and next time I’m sitting inside! Buger Hof: notable for that gorgeous 45 min walk down the river, which is well worth doing if you like to see the river and the trees. Zum Sternla: very old bar, worth a look, but the Maisel beer didn’t blow me away. Very central and easy to pop into while passing sometime, but for me not a huge priority. Würzburger Weinstube: good for wine if you need a break from the beer! I would say that numbers 1 – 4 on the above list are in the unmissable category, but try to get to 5, 6 and 7 too if you can. Hummel, Merkendorf: stunning place, stunning beer, wow, don’t miss this one! Keller now open too but we didn’t go – which I think was a mistake. Drie Kronen, Memmelsdorf: we stopped here on the way to Hummel – food very good, beer is ok but missable. Save yourself for the Hummel beers! However, Drie Kronen is a very nice old brewpub and the food is fab, so its well worth visiting and the bus links that Fred has worked out all work well. 27 euros for a Bayern ticket on the trains; all day from 9am to 3am next morning, go anywhere in Bavaria as long as you don’t use the high speed trains. Ticket valid for up to 5 people for the whole day! You can buy in Schiele travel agents on Lange Strasse to save you having to go to the station, and you can buy in advance. 20 euros for the Bamberg beer rucsack: gets you 5 free beers, a great rucksack, free glass and one coaster from each brewery, plus very good booklet on the beers and breweries, plus map. Buy in the tourist office. 8 euro bus and museum card; valid 3 days, gets you to a few museums (none unmissable though) and free bus travel, including to surrounding villages including Merkendorf and Memmelsdorf; saves the hassle of buying tickets. Get this card and timetable info in the Tourist office. Avoid the dumplings aka Kloss ('Kloß'). Grossest ‘food’ I have seen in years. We referred to them as sponge balls, and Fred teased us about them all week! Thanks are due to John White, whose promptings finally persuaded me to go to Bamberg, and whose Guide was an invaluable, very accurate and extremely comprehensive source of information which I used many times daily. I also need to thank Fred Waltman very much, whose own guide I also used every day alongside John’s. Between these two guides, you really do have every conceivable angle on the great beer spots in Bamberg and around. Fred was also superb company during the week, and we enjoyed the many beers we had during several different sessions during the week. It was beyond the call of duty for Fred to actually turn up and help guide us round the city during our visit! Thanks also to Ron Pattinson for his Munich guide, which more than did the job for our flying visit there. Thanks to Dan and Joelle for their notes on their recent trip, which also gave us another valued opinion. And thanks to everyone else who kept on at me to go to Franconia. I am grateful to you all.